Webroot® WiFi Security is a virtual private network that gives you security and privacy while you work, bank, browse, and more online. Protect yourself and get your free trial today. Your online life is private. Keep it that way. Tap or click to get the app! This easy-to-use VPN tunnel app automatically hides your IP address and personal details to let you use the web anonymously and privately, anywhere you connect. Simple and intuitive setup means you’re up and running with a single tap or click, and you never have to follow complex steps. With over 35 servers around the world, you know you’re getting maximum speed, convenience, and performance. * Only available on Windows®, Mac®, and Android™ systems. And how does it work with your existing internet security? A VPN protects your actual connection to the internet. Think of your connection to the internet like you’re on a road trip. If you’re on the open road, you’re exposed. Anybody watching can see where you go, how you get there, where you pull over, and more. But if you could drive through your own private system of tunnels, then nobody could spy on you. That’s what a VPN does. It gives you your own private connection so cybercriminals, ISPs, targeted ads, and others can’t spy, track, or intercept your data. 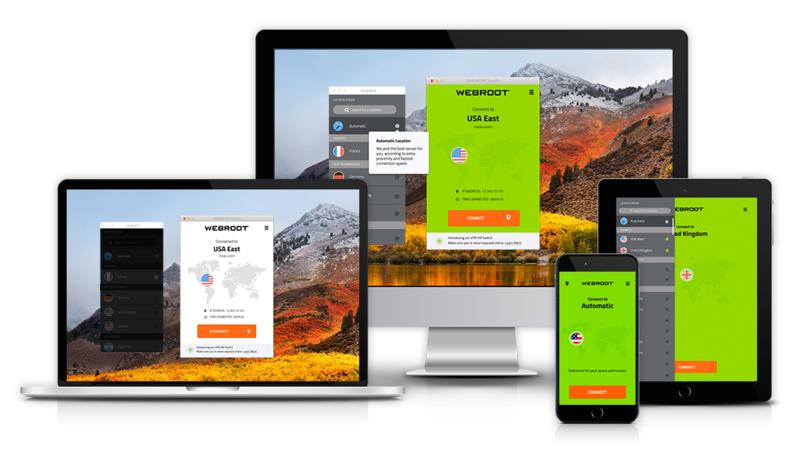 The Webroot WiFi Security VPN app and antivirus software go hand in hand. One protects your device, one protects your connection, and both work together to give you security and privacy as you work, share, bank, and browse online. We value your feedback. Help us get the word out by leaving a review here or in your app store below.